Place Value Practice Based on Common Core For Spring! - Fern Smith's Classroom Ideas! 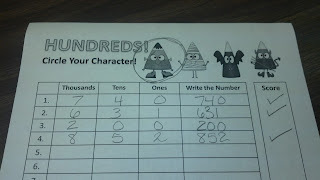 Place Value Practice Based on Common Core For Spring! 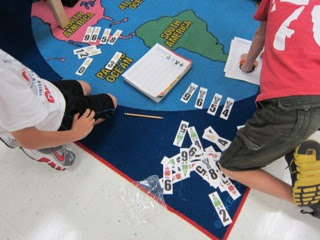 Just Buggy About Place Value Race Game! I'm just published about one of my favorite Place Value Race Games...this one has a bug theme and is just terrific to add a little Spring color to your math center! This game is a great way to differentiate for high, middle and low. It can be played with just the "Tens" version or the "Hundreds" version. Meanwhile, your high group students can be playing the same game, but with the "Thousands" version. It is also an excellent tool to use to teach in your small group and gather data for your RtI documentation. Observe a student and you will know instantly if they can problem solve to created the highest number when given three cards, 3, 6 and 8 for example. If they don't make it into 863, there's a problem! My friend, Denise, from Sunny Days in Second Grade, took pictures of her children playing the game and sent it to me. Three separate sets of student directions, tens, hundreds and thousands. Click here if you would like to buy it in my Teachers Notebook Store. 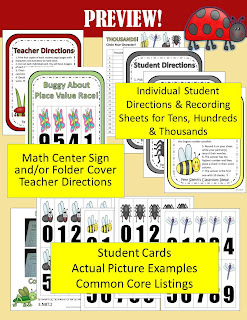 Click here if you would like to buy it in my Teachers Marketplace Store.